The ACEPSTYLING "Neurotoxin" grill is a unique and in your face design. We wanted to provide the Mazda community with something a little different. Our grill flows with the Mazda3 body lines while adding aggressive shapes within our design. Both the Mazda3 and Speed3 have different bumper dimensions; we had many obstacles to make this design fit both vehicles. We strived to hide the smile face look of the Mazda3 as well. Our grill is made from high quality strong and flexible FRP. All our products include detailed installation instructions and includes all mounting bolts, brackets and clips. We also provide many custom options to make each grill stand out from the rest. The Neurotoxin grill is a great way to highlight the Mazda 3 aggressive style by complementing the Mazda3 body lines. Let other car owners know what Mazda means to you! *Why you need this part today* Our easy to install instructions and unique designs are sure to turn heads and make customizing quick and easy. 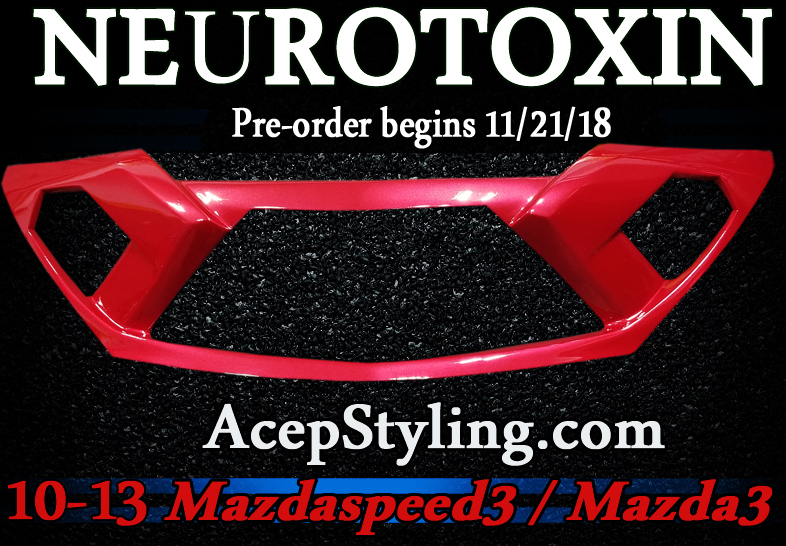 Click the button below to add the ACEP "NEUROTOXIN" Grill Insert armor fits 10-13 Mazda3 / Mazdaspeed3 to your wish list.